2000 - I met my future Husband. I was babysitting a friend's dog who had broken it's back when he came to the door. I knew right then and there, I was in love (he didn't figure it out for a while though!) When I become a little braver, I might disclose the embarrassing details of that day! It's quite funny! 2001 - Future Husband graduated from the University of Kentucky College of Engineering, obtained his first job and we moved to South Florida (I had graduated from Transylvania University in 1999). In October, we became engaged. 2002 - After being jobless since October 2001, I started my career in commercial real estate in February (I was in residential prior). AND Husband and I got married in June. 2003 - Husband and I bought our first house and THE dog U.K., our fantabulous golden retriever, entered our lives. (His name was Yukon and everyone thought that meant UConn. We quickly changed that!) I was also re-baptized as a Christian after some tumultuous trials and tribulations with my faith over my college years. 2004 - Husband moved jobs to a new company where he became well respected and known across several counties in Florida as the expert in his particular field (I'm so proud of him). 2005 - I started a new job as Director of Commercial Real Estate Property Management and Construction for a company covering multiple counties. I continue there today and love it!! 2006 - Husband and I decided to start trying for a baby, lost four babies (one at fifteen weeks) and nearly made a move to Atlanta. In November, we decided not to move after much deliberation and three weeks later, found out we were pregnant with Lallie (good decision not to move - the Lord works in mysterious ways)! 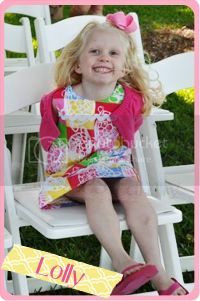 2007 - Our beautiful, gorgeous, 1st daughter, Lallie was born in July, after two month's of bedrest and some difficult medical issues. 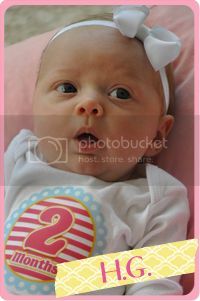 We thank God everyday for this beautiful baby. Husband passed the Florida P.E. licensing test on his first take and I passed the National CSM licensing test on the first try (studying with a newborn? It's a wonder I passed!) AND, two weeks before Lallie arrived, Husband started a new job as an Assistant Director of Utilities and Director of Engineering! 2009 - We sold our home and bought our second house in Florida. A much bigger house, with a pool on a golf course in which we can host loads and loads of family and friends (including EVENTUALLY another baby :-)! How about your decade??? Good, bad, ups, downs? Worst or best? This beautiful couple, Patrick and Jess, became engaged just before Thanksgiving and none of us could be happier to have Jess joining the family! Patrick is Husband's brother and the two of them have been dating for just a few months longer than Husband and I have been married! They were high schoolers back then (as Patrick is 11 years younger than Husband). Patrick and Jess were going to head out to the movies however, per his father, he had to check on calf that had the scours (which is cow indigestion. .to put it mildly). Somehow, Patrick convinced Jess to accompany him on this scour check!! Hmmm....anyways, once they were up there, in the serene quiet of the hillside (the scours was just a cover, thank goodness), Patrick proposed!! The following is a re-enactment. 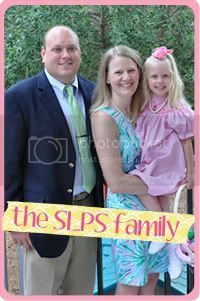 Here's a picture of the happy couple with Patrick's one and only niece, Lallie (a/k/a the Flower Girl). 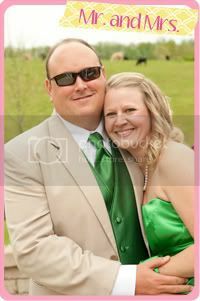 Jess has seven nieces and nephews as well that will be worked into the wedding as well! It's going to be a BIG wedding and Jess is SO excited (as am I, as I'm re-living my wedding vicariously through Jess). Congrats you to, you are both loved so much and we can't wait to make Jess part of the family!! So far, Christmas has been wonderful, and we still have one more to go, when we visit my parents at the end of next week! On Christmas Eve, Husband and I went out on an all day date! We haven't been alone in months, so it was wonderful. We started off at the famous Jim's Steak & Spaghetti in Huntington, WV and sat in the same booth JFK sat in when he ate at Jim's. Later, we went shopping for some last minute gifts. I finally finished Lallie's knit cap, just in time for her to come down with a cold, preventing her from going outside to use it. Oh well, it's still cute and Lallie loves to wear it! Well, look at that, Santa visited Granny's house! ....and brought Lallie lots of princess stuff, in which she proceeded to play dress-up with mommy. The brothers in their new lightweight pull over jackets from their mom. I am a fan of the Harry Potter books, always have been, always will be. It's not my typical read, but it really grabbed my attention after the first movie, I read all fo the books shortly after. I do not believe, whatsoever, that anyone less than a teenager should watch or read the books as younger kids may have difficulty separating fantasy and reality. In addition, the books are quite, quite dark. So, while I will keep the books for years to come, Lallie will not be allowed to read them for many, many, many years! Onto the movie, Husband and I rented itthis weekend on PPV. Husband has never read the books, so for him, the movie was wonderful and interesting, though I had to do quite a bit of explaining to him. 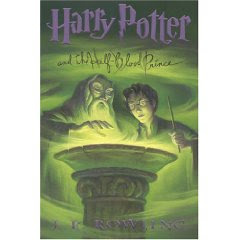 I think without reading the books, it can be quite confusing if you don't have someone narrating alongside of you. The other thing that confused him is I kept making statements likes "that's NOT how the movie goes, Nymphadora finds him, not Luna." "What about Fleur and Bill (and his battle with Fenir Greyback)?" "Wait, Lupin and Nymphadora aren't knowingly dating yet?" "Hello, Malfoy's mother did NOT go with him and all those other people to Bourgin and Bourkes". And yes, "I clearly do NOT remember Harry being in a diner flirting with a Muggle waitress!" Now, I understand the movie skipping a few of the darker moments in the book as to keep the movie short and the darkness to a minimum (sort of) for the younger crowd. And I really wasn't happy with the ending for that reason. However, considering the book is very long and extremely detailed, I can see why the movie took different routes. So, all in all, I think the movie was fantastic, it was full of action and I loved it. What about you other HP lovers out there, what did you think? Beth over at Social Climbers has declared a Preppy War! And, as far as I know, Black Labs and Lilly is the only one whose fought back in Battle #1! I am fighting back with STATIONARY (and remember which group of preps I'm in, the pink/green cult!) 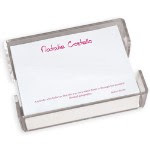 :-) No girl, especially a prep, can be without gobs and gobs of stationary, note cards, calling cards, all personalized of course. I have tons and usually have a great deal of inner dispute trying to pick the perfect card for a certain person/occasion. 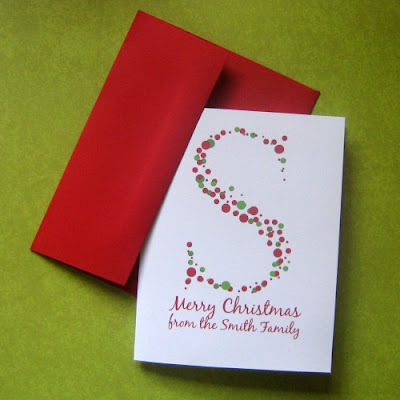 In addition, in true Southern style, I am a note card and thank you card writing fiend! 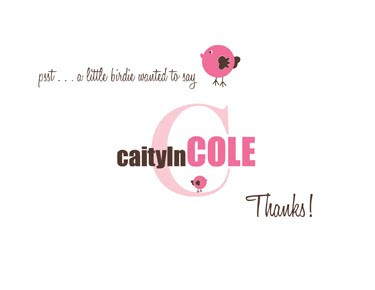 I was raised proper by my mother in understanding that a note card and thank you card MUST be personalized. And I don't mean, just saying "thank you for the present" with your signature, I mean writing a full blown note showing the recipient that they are thought of and/or thanked. First, my personal favorite, which I own from Molly Lou Gifts. Mine has some green in it, it's not a thank you and has our family name, but I just think it's so adorable! 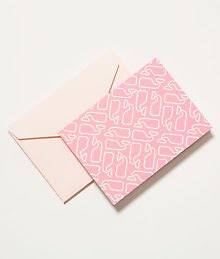 Then there is the sorority stationary. I chose Phi Mu as that is my sorority and the patchwork gives the card a little college flair while not becoming overly cartoonish (as some sorority stationary can get with their mascots). Notice how I'm not calling this my Christmas wish list - there is a reason for that. I want not and I need not, and I am extremely and truly blessed. I have everything I could ever possibly need, plus some, so to say this is a Christmas wish list, to me anyways, would be completely against the true meanig of Christmas. This is purely for fun! Okay, moving on....I have broken this down into categories. First ME! 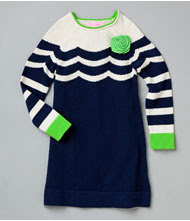 I love this Milly Ruffle Sleeve Merino Wool Dress. It's the classic cocktail dress, with just a tiny bit of flair. Perfect for any cocktail occasion and can be worn with some simple shoes or some great shoes. As Pretty In Pink Megan said in her blog post yesterday, wearing a matching color shoe is so passe! 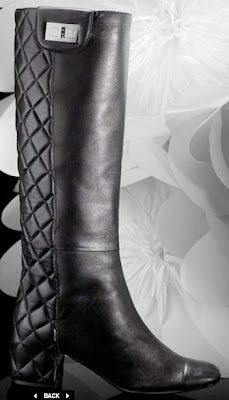 I love White House Black Market. I do own several things from there. They have great sales and are much more affordable and in my price range, while looking like (and feeling like) I'm wearing a more expensive outfit. I've tried a similar shirt, but it was much longer and poofier, this style would suit my body type much better as it doesn't gather in the waistline. 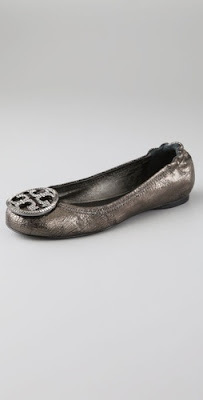 Of course, the shoe of the year is Tory Burch Lissie, which is apparently hard to find. I hear Nordstrom has sold out! I love the silver (very versitle) with the studded logo. So pretty! Okay - moving onto the family! We would love to have a sectional for our new living room. It would suit the room perfectly. 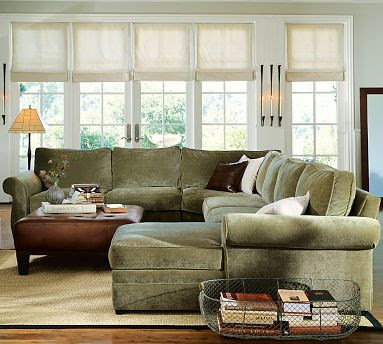 I love this one from Pottery Barn, with a different fabric/color and the extended ottoman on the other side. 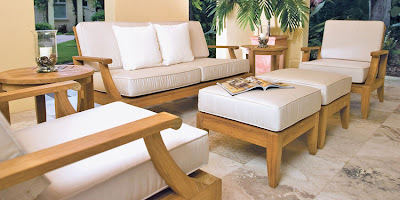 We haven't purchased pool deck furniture yet, really don't need any (we have a faux wicker set which works perfectly), but again, I would love all teak. Since we live in Florida, the cushions would never work (moldy = yucky! ), but if California - most definately! Next comes Lallie! She will be moving into a big girl's bed in just a few months. Husband wants a princess bed for his little princess. Isn't this darling and I already have the bedding set! Everyone knows how I love Lilly. Normally, I go for the pink and green, but with winter, navy has been my color choice for this year. This Odile dress is so cute and I think Lallie would look adorable in it! 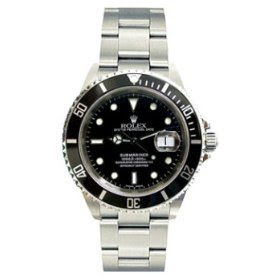 Last but not least, for the man of the house, the one who always provides but never asks for anything, a Rolex. Just a simple Oyster Precision Submariner Chronometer Stainless Steel watch (okay, how is that simple? I had to look 4 times to get that name right and don't even know what half of it means, I'm sure Husband does!) He loves watches and I think for him, this would be the ultimate gift! So, that's my "Dream Big" wish list! There was a conversation on Twitter earlier today about what people are serving on Christmas Eve, New Years, Christmas Day (or whatever day or holiday you celebrate). I don't know what we'll be having as I'm not the one cooking the meal, but every year is something different depending on where we are located. 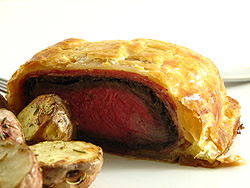 I thought it would be fun to post of few different meal ideas and I'd love to hear about what you're planning. My mom has baked cornish hens, one for each person, in the past and the presentation has been gorgeous, much less eating it. Martha Stewart has several recipes (the one with the 40 cloves of garlic being my favorite, but you might not want to serve that the multiple people - hold our nose!) 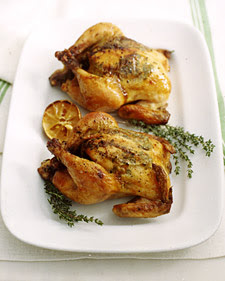 This lemon and herb recipe looks fantastic! What about Terducken? This dish has always fascinated me. Husband and I love to watch the Food Network and we've seen everyone from Paula Deen to Guy Fieri show off this dish. It's just fascinating to watch it being made. Are any of you brave enough to try it? HERE's Paula Deen's recipe. Of course, there are always the old traditional stand-bys, turkey (you all know what a turkey looks like) and ham, depending on your traditions. For a pre-baked ham, no one does it better than Honey Baked Ham. We didn't have a Honey Baked Ham in my hometown. But I worked at a llittle bakery called Dumplin's in the mall and the calls for Christmas ham reservations started well before Thanksgiving. We had one cooler completely filled with hams to the rim (organized by weight) and we would carmelize them by hand with a blow torch. We sold them ham for sandwiches during the lunch hour and man, those are the best!! Of course, we must remember our vegetarian guests. I've never hosted a vegetarian, so I had to do a little research. I came across the Vegetarian Society website and found this dish. I think it looks fabulous. It's completely vegetarian, yet has the feel and presentation of a full-blown holiday dish. 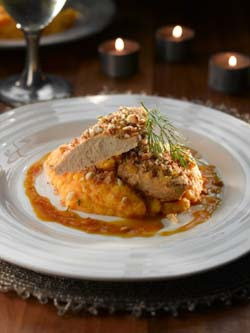 It's a Festive Fillet with Orange and Pomegranate Sauce (made with turkey-style fillets). So, now that your mouth is watering, I want to know what you are planning on serving at your holiday meal this year?